Unfortunately for Mr. Obama, his not so secret “Kill List” has proven him to be even weaker than most of us already knew. He is clearly a loser on the economy, a near Enemy of the State when it comes to preserving, protecting and defending the Constitution, and now he has abased himself to the level of a cold-blooded murderer, assassin, and international terrorist. He has done irreparable damage to any sense of justice in the World. Picture this. A friend calls me and says, “Hey, I want you to meet a guy named so and so. He has a few dollars to spend and he wants to hire you to do such and such.” I agree to meet him. I don’t know this guy from Adam. I have no idea that he’s on Obama’s “kill list”. He arrives at my home along with two other guys. I don’t know any of them, or what they are about, I’m simply meeting with them to find out. The doorbell rings. I open the door. Within seconds, 4 hellfire missiles rain down on my house killing me, my family, and the alleged bad guys. The story comes out that my family and I were a group of “suspected militants” meeting with some top commander of some militant group when we were killed by a U.S. drone. You cheer. But an innocent family was just murdered, and for no good reason. An article appeared on Saturday entitled, “We are sleepwalking into the Drone Age, unaware of the consequences.” It was written by Clive Stafford Smith, the founder of Reprieve, a group of international charities dedicated to assisting in the provision of effective legal representation and humanitarian assistance to impoverished people facing the death penalty at the hands of the state. Mr. Smith has spent 25 years working on behalf of defendants facing the death penalty in the USA. Whenever I read a news headline, stating that “we” just killed another group of suspected militants, I don’t feel any sense that justice was served, none at all. I think to myself, ‘Great, now we’re killing suspects.’ There’s a big difference in my mind between a “suspect” and a “known terrorist”. What are we fighting now, the War on Suspected Militants? Don’t get me wrong, I don’t mind hearing that the CIA took out Abu Yahya al-Libi, al- Qaeda’s second-in-command, in its latest bombing raid. That doesn’t bother me so much, although I would rather he had been captured, interrogated, and tried. But what disturbs me is that 16 other people were killed in the attack, and no one has bothered to mention who they were. When we read the story from Bloomberg, we learn that the bad guy, Abu Yahya al-Libi, was spotted by a drone, which followed him to a house and killed him. There’s no mention of whose house he went to, or of the other 14 people (aside from his driver and personal bodyguard) who lost their lives. Were the others terrorists, suspects, or just innocent victims who happened to be in the wrong place at the wrong time? The problem is that we may never know. The Bloomberg story reads, “The U.S. drone that spotted al- Qaeda’s second-in-command getting into a car, followed him to a house in a North Waziristan tribal region and killed him on June 4 dealt another serious blow to the terrorist group’s remaining core in Pakistan, administration officials said.” It just sounds like a drone followed a bad guy and killed him. But when we read the story from the Guardian UK, we learn that actually up to 17 people were killed in the attack. On the previous day, Mail Online reported that 10 people went to a home to console the brother of a suspected militant killed in a drone attack on the previous day. 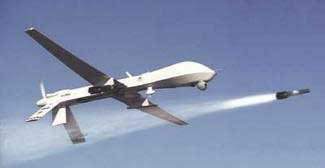 When they arrived at the home, they were killed by hellfire missiles launched from another U.S. drone. Of course, they were all classified as “suspected militants,” although the story reported that the brother was among the dead along with at least two who were believed to be foreigners. Is this the new justice? Kill a suspect, and then when friends of his survivors come to mourn, kill them too? Following a group of people who have gone to a home to offer condolences to the family of someone you murdered yesterday, and then killing them, along with the family of the deceased, is an act of terrorism. Are we following al Qaida’s playbook now? Do we know who we killed? Or more importantly, do we care? Apparently, Barack Obama doesn’t. He just wants to look like he’s doing something, but we must never confuse motion with action. Two wrongs don’t make a right. If this is justice, then I’m living in the wrong country. What really worries me is what’s going to happen in the future, when the bad guys get their own drones, and start targeting U.S. households. We’re not the only ones with drones now, so what makes us think we can control them? Are we controlling them? This reckless Administration has set a dangerous precedent, and it may be too late to reverse. I think we need to revisit the idea of what it means to bring someone to justice. By using terrorist tactics to assassinate alleged terrorists and suspected militants, without due process, Barack Obama has presumed the role of judge, jury, and executioner, and has single-handedly destroyed any sense of justice in the World. Yet justice must be served. It’s up to the rest of us to right Obama’s wrongs. Step one is his removal from office. Step two is ensuring he stands trial for war crimes. If you are a Democrat, and don’t agree with Obama’s policies, then either jump ship now and help to ensure his defeat, or keep your mouth shut and get out of the way. You have no defense. A- My only problem with this, is that I don't believe we are fighting a war. I believe we are violating the sovereign rights of the citizens of Pakistan, by selectively bombing residential dwellings, with unmanned remote controlled drones launched from 8,000 miles away, based on faulty intelligence purchased from unreliable sources, and for the most part killing innocent people who are not even remotely associated with either al-Qaida, or the Taliban. This doesn't exactly measure up to our great victory at the beaches of Normandy. When the first Hellfire Missile rains down from heaven, and comes crashing through a residence in suburban America, then maybe folks will start to wake up. It's a shame that most conservatives don't have the guts to call this what it is. Terrorism! You raise great points here and we must not be too quick to cheer the death of new 'suspected' terrorists lest we be next on the kill list. We are on a very slippery slope right now and we could very easily get to a point where they are patrolling US skies and hunting down US citizens. This is science fiction horror type stuff that would've been unthinkable 10 years ago.